A baby is among 15 bodies due to be exhumed as part of plans to build a new depot on a graveyard. The paupers' graves at Tunbridge Wells Cemetery are unmarked and date back to the 1800s, but records show their names. The borough council has issued a public notice, as per its legal obligations, of its plans. A spokeswoman said the remains would be treated "with dignity" and reinterred elsewhere in the cemetery. The current contractor's depot on the site is "no longer adequate for its use", the council said. 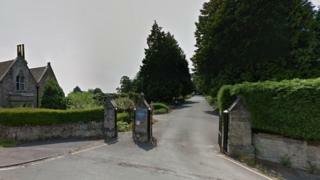 A section of land has also been earmarked for new homes, although no plans have yet been submitted and the council said "no specific details have been agreed". A council spokeswoman added: "We will ensure that all found remains are treated with dignity and we plan to reinter them in another part of the cemetery and ensure they are suitably and respectfully marked." Relatives of those buried have two months to contact with the council if they wish to make their own re-burial arrangements. Lawrence Heasman, councillor for Pantiles and St Mark's ward, where the cemetery is based, said he had no idea there were graves at the site. "There has been no inquiry or visits to this part of the cemetery for a very long time," he added.